I knew I wasn’t entirely ready for the Oregon Wine Country Half Marathon, even though it’s been on my calendar for nearly a year. Summer, work, travel, kids, they all got in the way of a perfect training schedule, or really any consistent training schedule for that matter. I hadn’t had a long run (and by “long” I mean anything over five miles) in well over a month. But then again, I’ve never really been “ready” for any major race. The one time I did feel totally prepared for a race and had completed a near perfect training schedule ended up being my worse race ever. So I just went into this race feeling like it was just another run. Just go with it. Worst case I could just walk a lot. 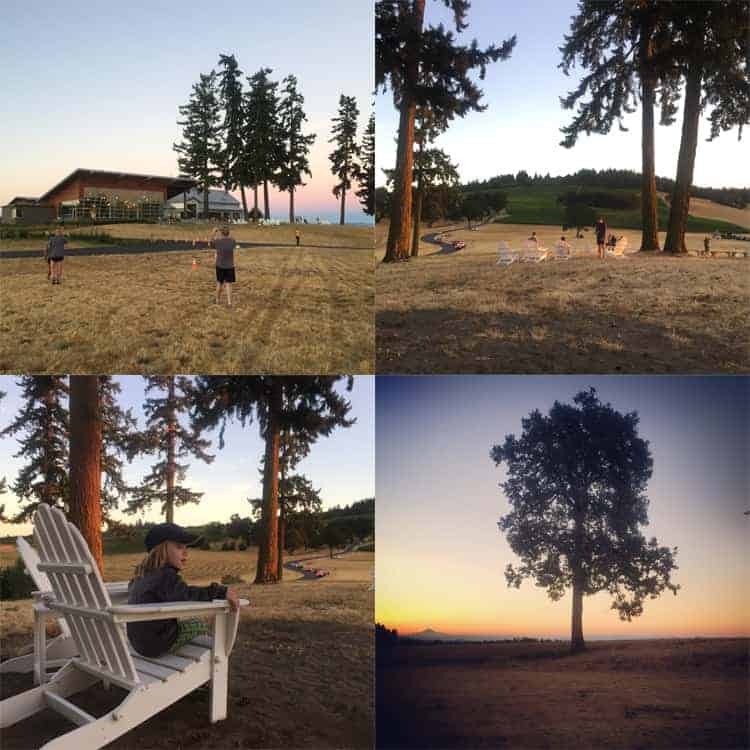 After the grueling wake up call at 4:30am, and driving one hour down to Stoller Family Estate we arrived just in time to watch another perfect sunrise. That alone made it worth the effort. And this time the kids were there to send me off and wish me luck. Bonus! The energy of this race is always so fantastic. I’m not a morning person (at all! ), but there’s something about the crisp cool air and being surrounded by the scenic vineyards and energy of thousands of other runners. It’s hard to be grumpy, even if you are about to run 13.1 miles. While waiting for the send off I heard some pretty cool stats about this year’s event. 55% of the participants were from out of state (that’s because Oregon is fan-flippin-tastic and a great place to share vacation time with a running event! ), and also 72% of the participants were women. Gooooooo girl power! I started in the middle of the crowd, with low expectations of my performance. I had doubts I would beat my 2013 time, but hoped to not be too slow. I started out feeling strong. The pace of other runners was pretty fast, so I just kept up with them. After the first three miles I realized I was running a less than 9-minute mile (that’s pretty fast for me). I also realized something else. The first half of this race is hilly! Last year, when Sean and I decided to do the relay, I convinced him that the first part of the race was easy and hill-free. He’d be lucky to do the first part. It was the “easy part”. The first half is totally hilly. Not major inclines or anything, just non-stop rolling hills. Up and down. And just when you think it’s going to get flat again for a while…. boom, another hill. Enjoy those hills, suckas! In retrospect, I’m pretty sure me noticing every percentage of incline was likely due to the fact that I was a bit out of shape this year? Whatever the case I couldn’t stop thinking about those hills. It’s a good thing the scenery made up for it! Around mile 7 is the switch off (for the relay runners that is). This is where I began last year. It does start with a minor hill, but then flattens out for the remainder of the run. 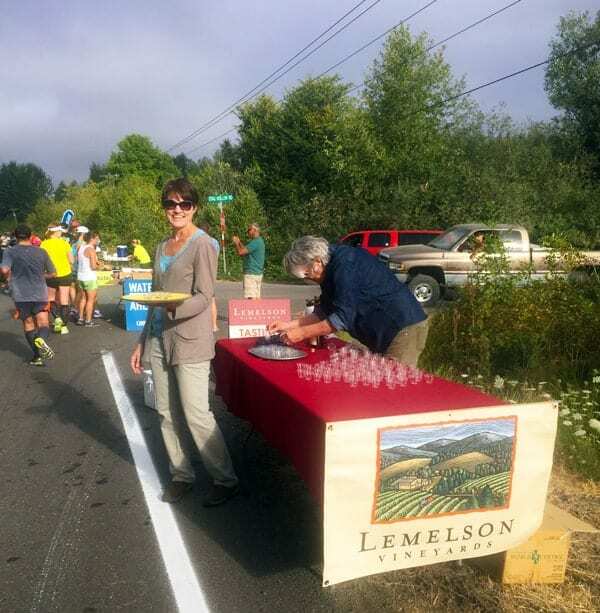 Just after the obligatory Lemelson wine tasting stop around mile 8 (I had to do it! ), my knees went out. Both of them. WTF. Dear Pinot Gris, please hydrate numb me and make me forget about the shooting pain in both my knees. Please! I was doing so well, and feeling so strong, then my knees had to go all rogue on me. Jerks. To top it off from miles 9 to 12 the terrain is completely gravel. Not the easiest to run on, especially when you have two wonky knees that aren’t behaving the way you want. I had to start walking for a while (and thus killing my time), which then turned into a run-walk. Eventually my gait resembled a zombie, with me using my right leg to power forward, and the left was dragging far behind. At one point a young man actually turned around and asked me if I was okay, and I responded with a loud incomprehensible grunt. If it looks like a zombie and talks like a zombie. I think I frightened the poor guy because he quickly left my sight and jolted forward. I never saw him again. But the two ibuprofens I took when I first felt the pain began to kick in just before the gravel ended and I just pushed through to the finish. Time for wine!!! I had suddenly forgotten about the knee pain and the hills, because I had finished! The good news about finishing with decent time is that there are no lines at the wine tents. Boom! Though I do recommend hitting up the tents you are most interested first, because the lines do quickly form (just a tip for the impatient, like myself). Ending the race and being rewarded with some cold rosé is worth all the aches and pains. I know what you’re thinking. Yeah yeah yeah I could easily just skip the run and go straight to the rosé, but where’s the fun in that? Despite my less than perfect performance this remains one of my favorite races! It’s a challenging run, but it’s so stinking gorgeous along the way. The energy is lively. The weather is always perfect. The post-race entertainment and wine is always a treat. And the town of Carlton is always friendly and welcoming. 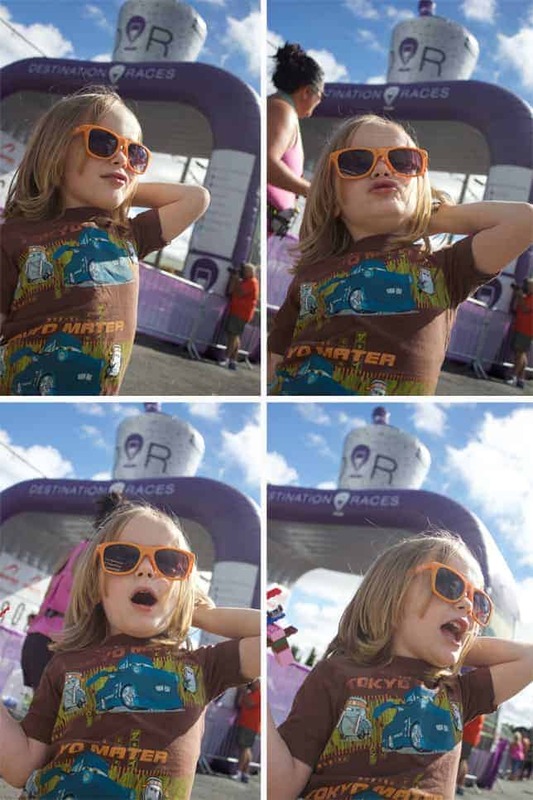 It also helps if you have two cute boys to cheer you on at the finish line. I say if you’re going to physically challenge yourself to something like a half marathon, especially your first half marathon, you should pick a race that rewards you in the end. For me, it’s great wine, great people, great scenery, and great cheerleaders. 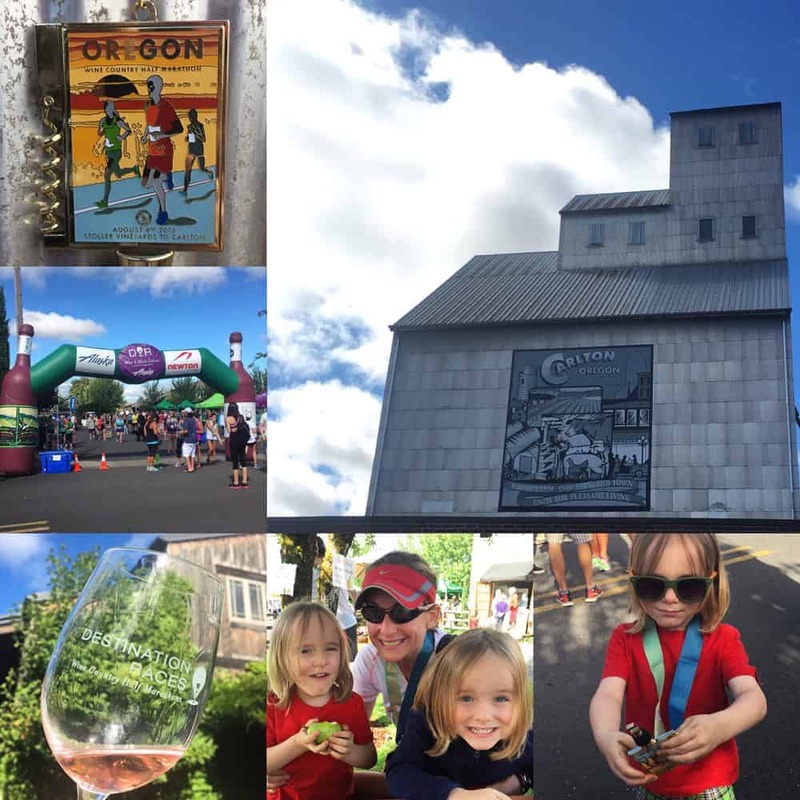 The Oregon Wine Country Half Marathon is the only race I’ve done through Destination Races (and I’ve done it three years in a row now), but based on all of the events they do (all lf them located in different wine country destinations throughout the country), I’m very tempted to register for more. They do an excellent job, and their theme is right up my alley. You can see the list of all their races here. 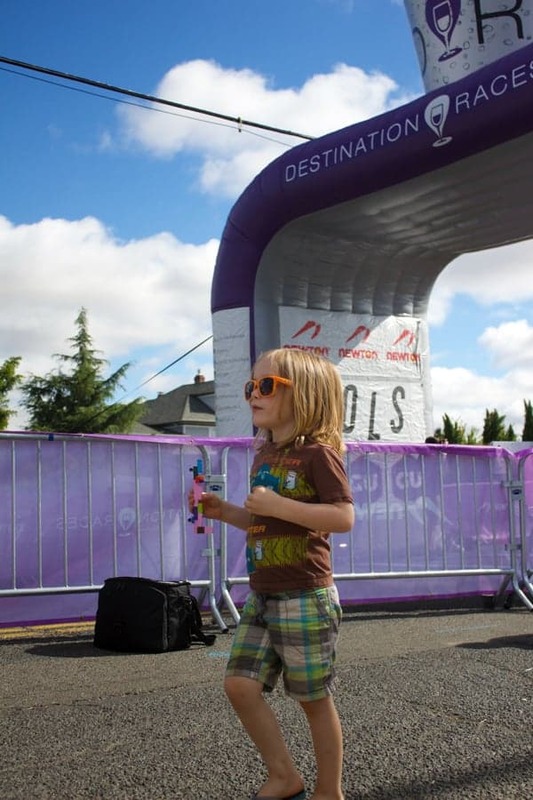 I hope to see you all at next year’s Oregon event (and perhaps a race or two before that. Healdsburg anybody?). Coming up next, the ridiculously amazing pre-race dinner we made to power me through the 13.1 miles of running. Hint: it’s smoked! Kudos to completing the race and capturing great shots along the way – I’ve only done the photo part in the past, and even shooting the event I can attest to those hills but also beautiful views! Great article. Thanks so much, Andrea! And so I’m honored you said such kind things about the photos, especially coming from you! 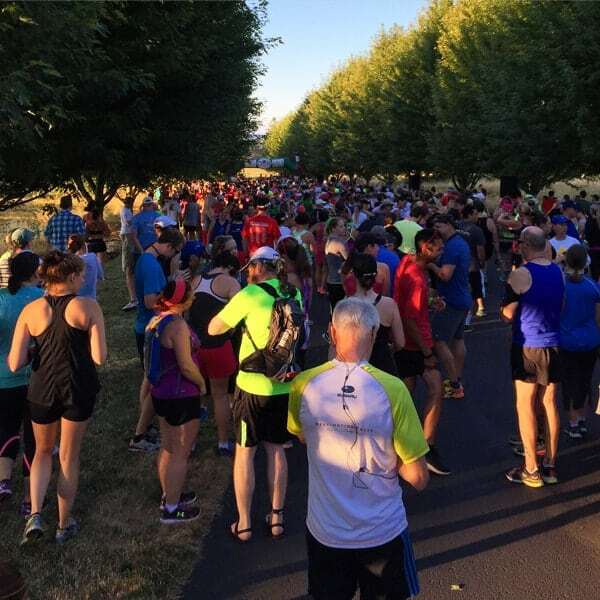 The Oregon Wine Country Half Marathon is truly a hidden gem, offering an experience unique to any of its sister events in the series. Less than an hour from Portland, this thriving wine region is a favorite of Pinot Noir lovers and romantics who desire a less hectic vacation experience.